The triangular tip of an Imperial star destroyer. The floating handgun that is the USS Sulaco. The lopsided bubble of 2001's Discovery One. For over 40 years, science fiction has gifted us a scattered toolbox of spaceship designs that burn bright in the memory; many of which owe their life to tinpot budgets or bizarre obsessions with food stuffs. Rather than attempt an exhaustive list; an A-wing to Zarkov Rocketship of famous craft, we've asked a Hollywood concept artist to pick the most iconic spaceships in cinema history. Gavin Rothery (follow him on Twitter at @gavrov), concept designer on Duncan Jones' acclaimed Moon, offers insight into the creation of these spectacular vehicles, and how they ignited our imagination like solar flares. Gavin is part of the panel for Space Rocks that takes place on Sunday April 22 at indigo at The O2. For more information go to Space Rocks Official. Why it's a damn fine vessel: Also known as the Rebel Blockade Runner, this ship was actually the original design for the Millennium Falcon and appears as such in Ralph McQuarrie’s early concept illustrations for the film. 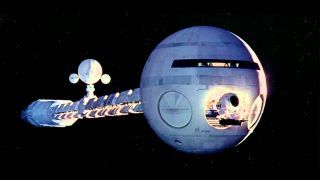 George Lucas felt it was too similar to the Eagle ships from Space 1999, and asked for it to be re-designed by Joe Johnston into the Falcon we know and love today, with the brief 'think of a flying saucer'. Why it's a damn fine vessel: Probably one of the most elegant space ships ever designed, the Lambda class Shuttle stood apart from the rest of the imperial space craft in the movie saga. Inspired by the “Skyhopper” vehicle briefly seen in A New Hope, one of these graceful ships makes a cameo appearance in the pilot episode of Joss Whedon’s Firefly. Why it's a damn fine vessel: From the early days of the Gerry Anderson cinematic universe, Fireball XL5 was actually named as a riff from a popular motor oil of the era, Castrol XL. The ship itself was based on a theoretical Soviet design for a suborbital rocket bomber called the Keldysh. Why it's a damn fine vessel: The Gunstar broke cinematic ground for being the first spaceship that was entirely computer rendered. A Cray X-MP pushed the pixels for this 1984 classic video game riff on the “Sword in the Stone” story. Although the arcade game in the film was fictional, it has since been made by the fan community, complete with it’s own custom arcade cabinet identical to the one in the movie. Why it's a damn fine vessel: The original Battlestar Galactica is essentially an aircraft carrier in space, creating a surprisingly original looking design for the era. The interior of the Galactica sets were filled with redundant laboratory equipment such as multi meters, power supplies, and racks of signal generators to give it the “war room of the future” aesthetic. Why it's a damn fine vessel: This iconic shuttle craft was realised in the movie using practical effects, various scale miniatures, and a full-scale build of the ship on-set. Inspired by the 1980s space shuttle, this sleek landing craft is one of the most recognisable vehicles seen in science fiction film in recent years. Why it's a damn fine vessel: Originally pitched as “the Shining in space”, the iconic experimental ship Event Horizon hosted some of the most graphic horror put to celluloid in the '90s. The ship’s design perfectly reflected the horror inherent in the story, and the spooky, gothic design is as much cathedral as it is space ship. Why it's a damn fine vessel: Another vehicle based on theoretical NASA designs of the ear, the Discovery Pod was a throwback to earlier design revisions where the artificial intelligence HAL was to have a full robotic body enabling him to move around the ship. The only remaining aspect of this in the movie is when astronaut Frank Poole is killed by the pod cutting his air pipe. HAL’s eye can be clearly seen at the front of the pod as he takes control. Why it's a damn fine vessel: The Alien ship from District 9 was the perfect modern update on the “Alien saucer hovering over the city” trope. It’s iconic design and visual punch helped sell the film and it deserves its place as a perfect case study on how to take something old and make it feel new again. Why it's a damn fine vessel: Reflecting the optimistic era in which it was designed, the original Thunderbird 3 is a beautiful take on the old-school notion of what a “space rocket” should look like. The bright orange colour scheme was pretty bold for the time and over the years this design has taken it’s place as a stone cold classic. Click 'Next Page' to see entries 15-6 in our countdown of the best sci-fi spaceships.